CHITIN: used in fungi cell walls, arthropod, exoskeletons, and dissolving stitches. 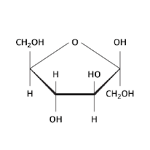 1) TRIGLYCERIDES: consists of 3 fatty acids attached to a glycerol molecule. fatty acids vary in structure by the number of carbons and by the placement of single and double covalent bonds between the carbons. 2) PHOSPHOLIPID: looks just like a lipid except that one of the fatty acid chains is replaced by a phosphate group. the two fatty acid "tails"of the phospholipid are nonpolar and hydrophobic and the phosphate "head" is polar and hydrophilic. a phospholipid is termed an Amphipathic molecule because it has both polar and nonpolar regions. Monounsaturated: fatty acid has one double covalent bond and each of the two carbon in this bond has only one hydrogen atom bonded to it. Polyunsaturated: fatty acid is like a monounsaturated fatty acid except that there are two or more double covalent bond. Saturated: fatty acid has a single bond between each pair of carbon atoms and each carbon has two hydrogen bonds. Amino acid are joined by "peptide bonds"
2) SECONDARY STRUCTURE: of a protein three-dimensional shape that results from hydrogen bonding between Amino & Carboxyl group of adjacent amino acids. spiral (alpha helix) or folded plane (beta pleated sheets) both form Fibrous proteins. 3) TERTIARY STRUCTURE: of a protein additional three-dimensional shaping and often dominates the structure of Globular proteins. contributing factors: Hydrogen & ionic bonding between R groups of amino acids. Hydrophobic effect that occurs when hydrophobic R groups move toward the center of the protein (away from water). Formation of Disulfide bonds helps maintain turns of the amino acid chain. 4) QUATERNARY STRUCTURE: describes a protein that is assembled from two or more separate peptide chains. nucleotides consists of a phosphate, a pentose sugar, and a nitrogenous base. 1) DNA: stores information about primary structure of proteins and the sequences of RNA molecules is heritable. 2) RNA: transmits and translates DNA information into proteins. many enzymatic and regulatory functions.